As per central government reports, water storage in 91 major reservoirs of India as on Sep 29, 2016 stands at 117.202 Billion Cubic Meter (BCM). This is 74% of total capacity (157.799 BCM). Compared to last year, current capacity stands at 122% (97% compared to last 10 years). Punjab, Rajasthan, Jharkhand, Odisha, West Bengal, Gujarat, Maharashtra, Uttar Pradesh, Madhya Pradesh, Chhattisgarh, AP&TG (Two combined projects in both states), Andhra Pradesh, Telangana and Karnataka. Himachal Pradesh, Tripura, Uttarakhand, Kerala and Tamil Nadu. 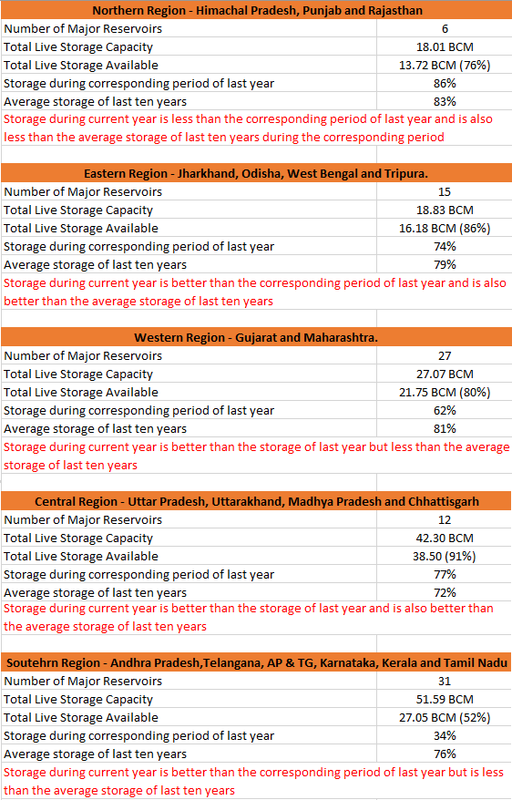 If we carefully look at numbers; in southern region (Andra Pradesh, Telangana, Karnataka, Kerala and Tamilnadu) total live storage available is just 52% of total storage capacity. Last year at same time it was just 34%. Even if this year looks better, total storage is way below the long term average of 10 years - 76%. This chart should be an eye opener for southern states. Water is no more an easily available item. If we continue to neglect the ecological needs of Western Ghats and not taking water harvesting, drip irrigation and water conservation seriously, as years passes, dams will go dry within 2-3 months of post monsoon rains. There may not be any water left for summer months in future.